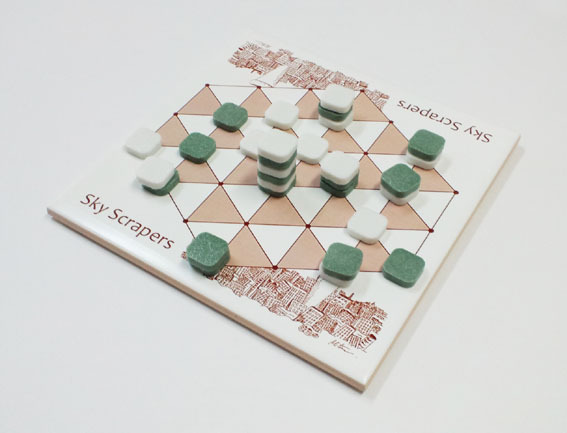 "Sky Scrapers" is a game of attacking pieces for two players. 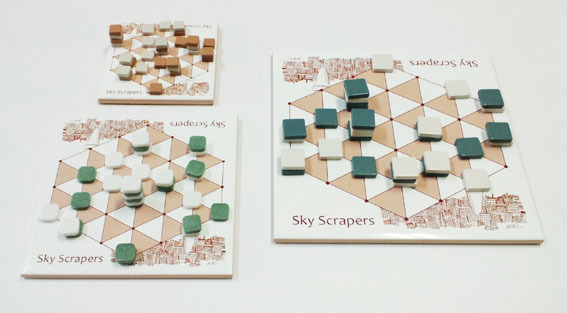 Each player moves to stack his pieces onto other piece(s). 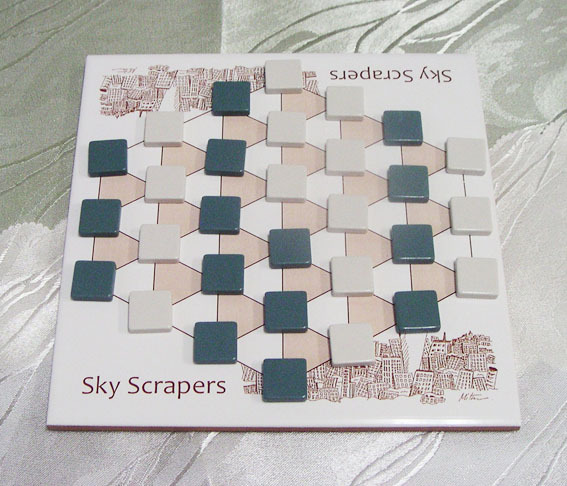 A sky scraper is four or more pieces. 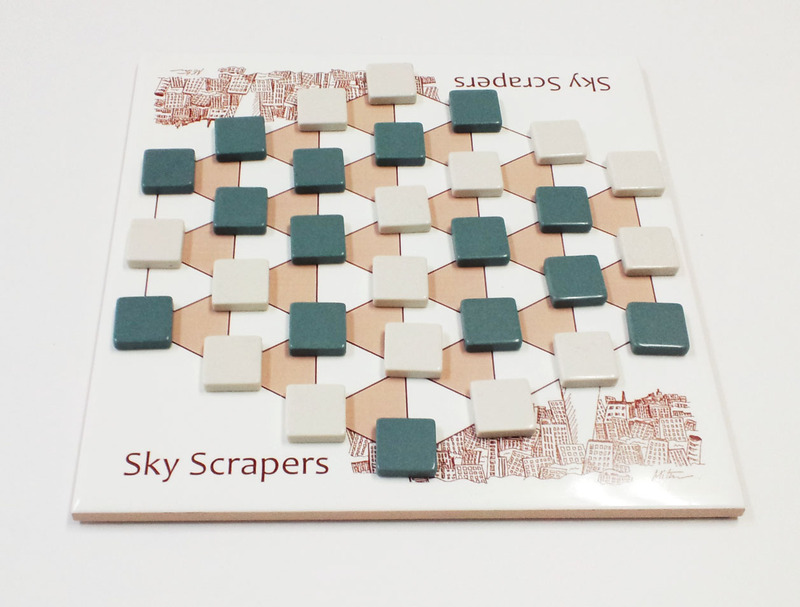 The winner is the player with most sky scrapers. 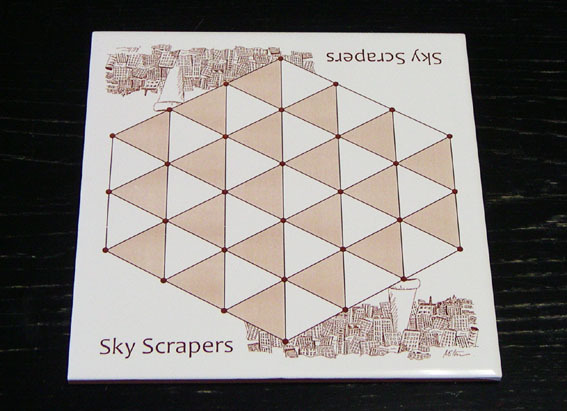 more information in Japanese about Sky Scrapers. click here! 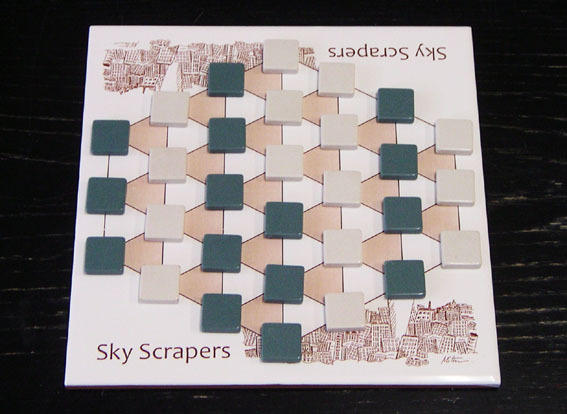 In this game, a stack of four or more tiles is a sky scraper. 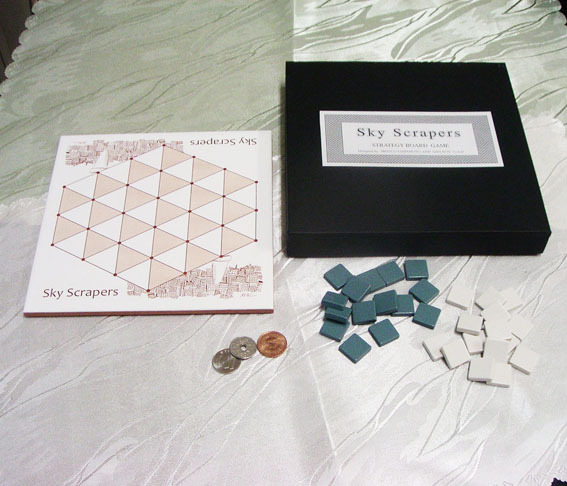 The winner is the player with the most sky scrapers at the end of the game. 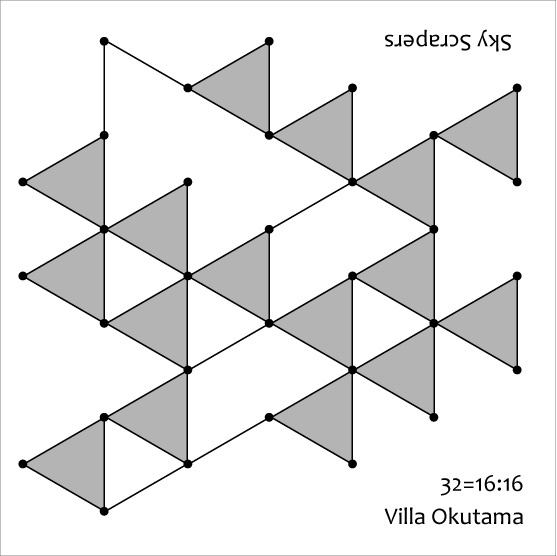 Each player starts with the same number of tiles, laid out symmetrically on the board, as shown. 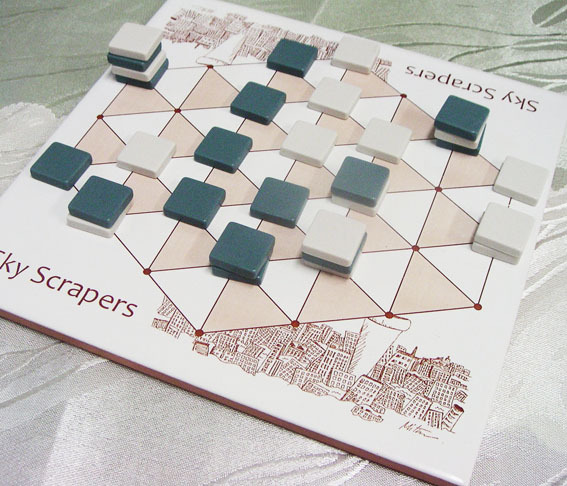 Players then take turns to make one move at a time. 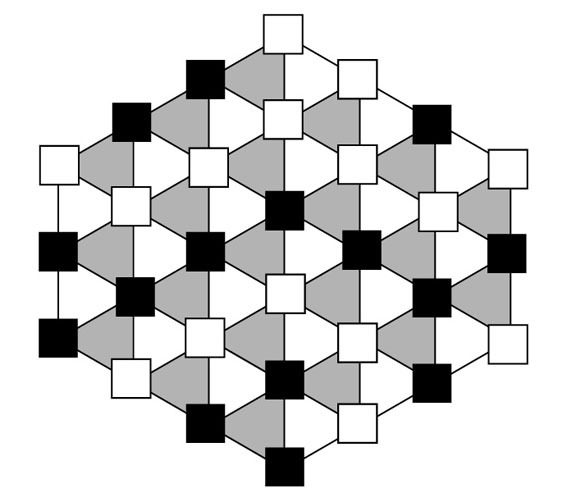 Tiles can be moved in any direction along the lines on the board. 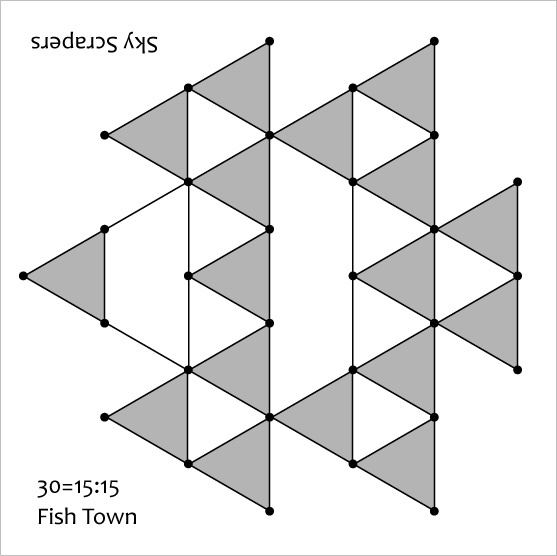 When a single tile is moved, it moves one space. 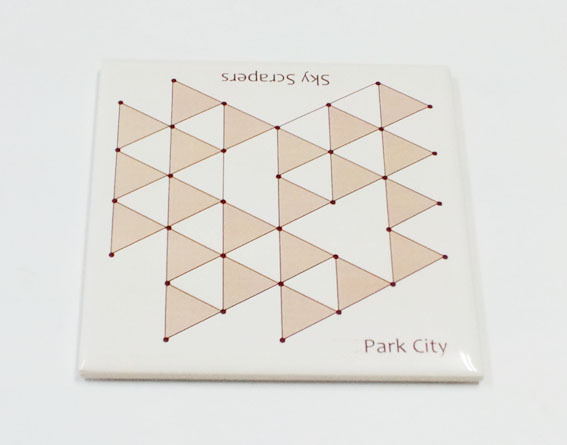 It must land on another tile or stack. It may land on a player's own color or the opponent's color. 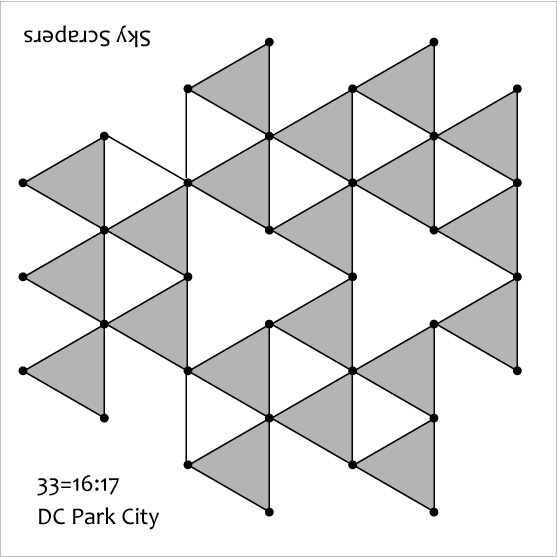 When a stack of two tiles is moved, it moves two spaces. 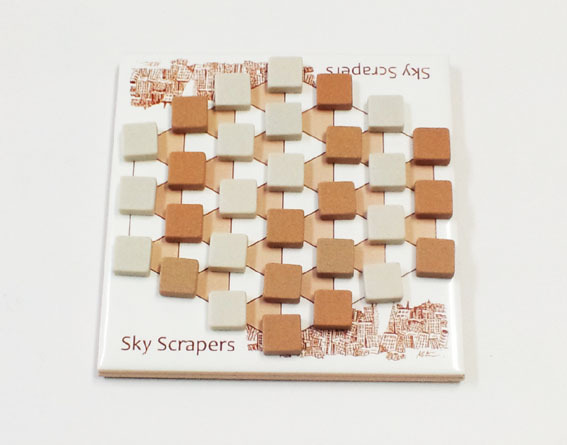 It must land on another tile or another stack. It must not land on an empty space. Moves must be in a straight line only. 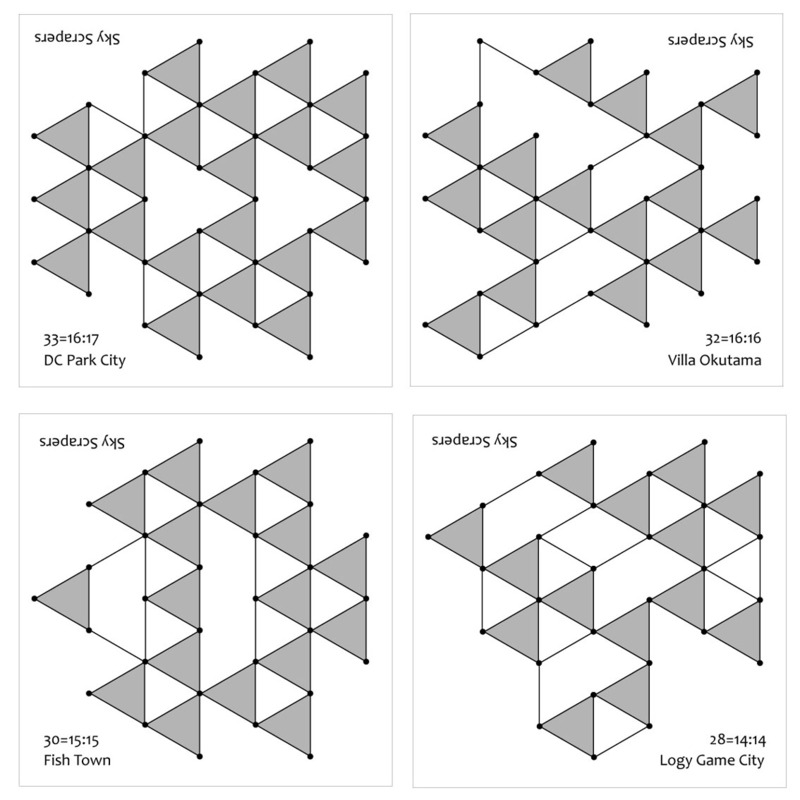 When a stack of three tiles is moved, it moves three spaces (a stack of four moves four spaces, and so on). A player may not pass, or miss a move, as long as a move is possible. The last player with a possible move keeps making moves until no further move is possible. 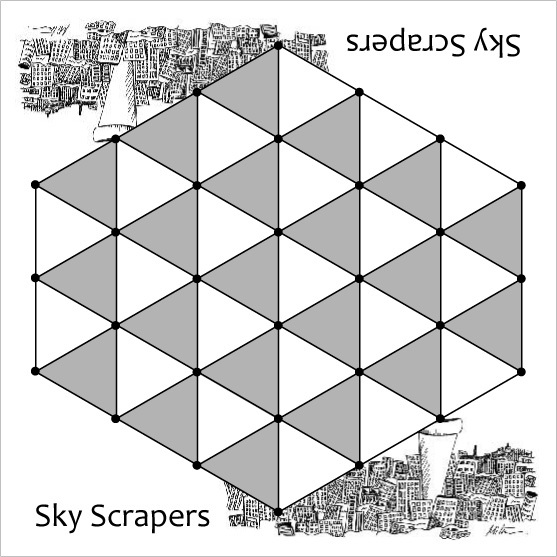 Is the player with the most sky scrapers. If the number of sky scrapers is equal, the winner is the one with the tallest sky scraper. 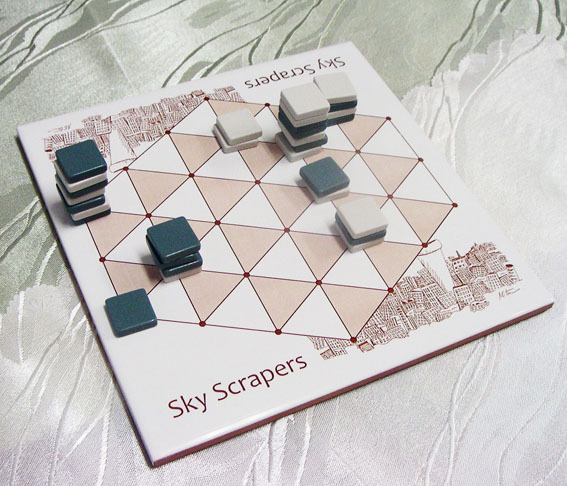 As shown above, this game ends with blue having the highest sky scraper. 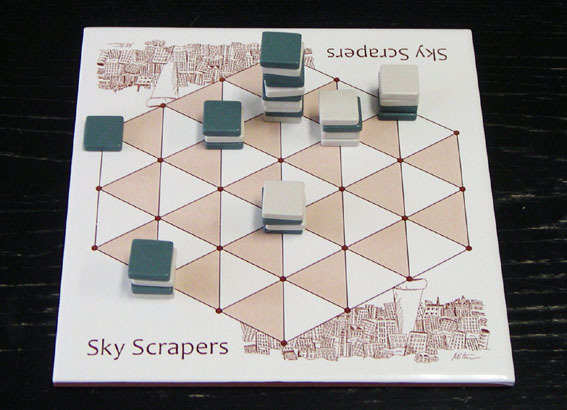 However, white wins with three sky scrapers, while blue has only two. 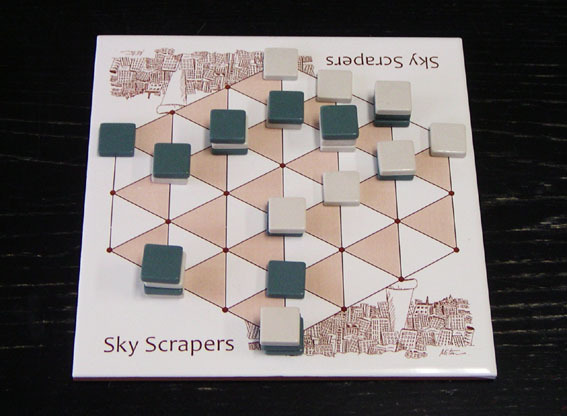 The starting position described above is for the basic Sky Scrapers board game. 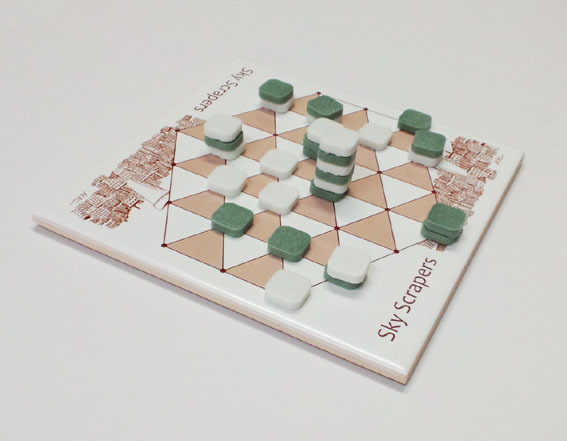 However, in terms of strategy and enjoyment, the game is the same even if you place the tiles on the board at random, as long as each player has the same number of tiles. 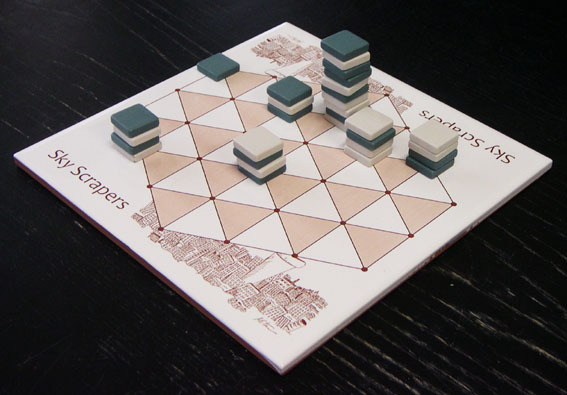 Also, the board may be any size and any shape, as shown. The rules of play are the same. 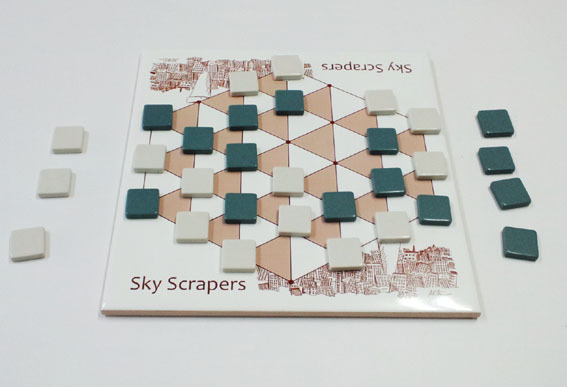 You place all pieces on the board at random. 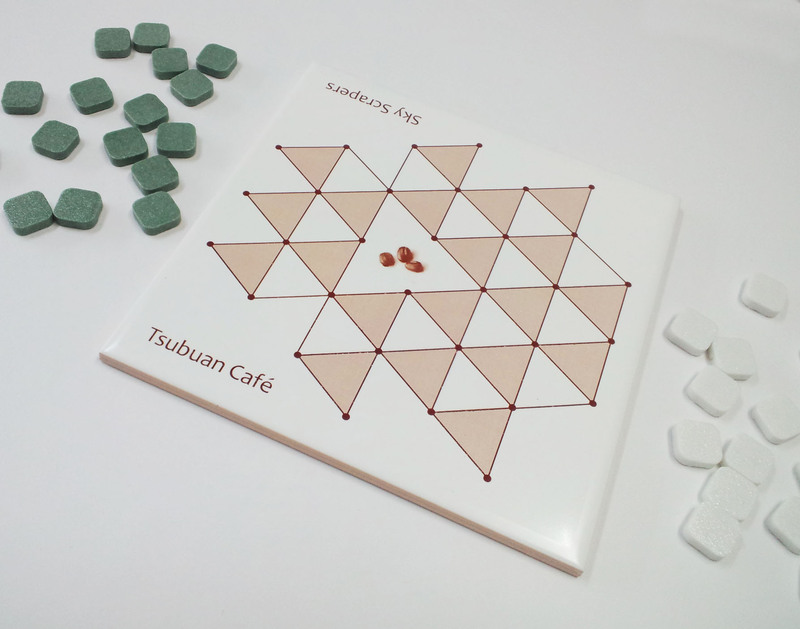 Which player moves first can be decided by tossing a coin or throwing dice. 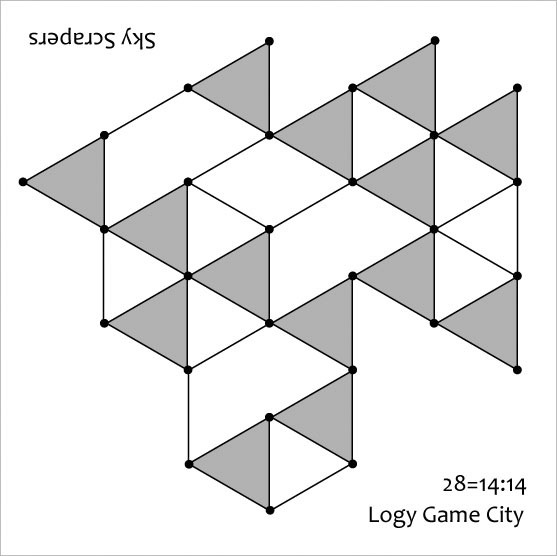 The player moving second chooses the color. 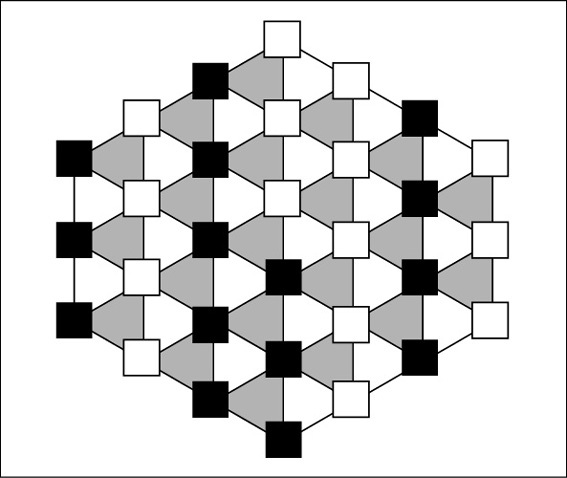 Which color belongs to which player is decided first, before placing any pieces on the board. 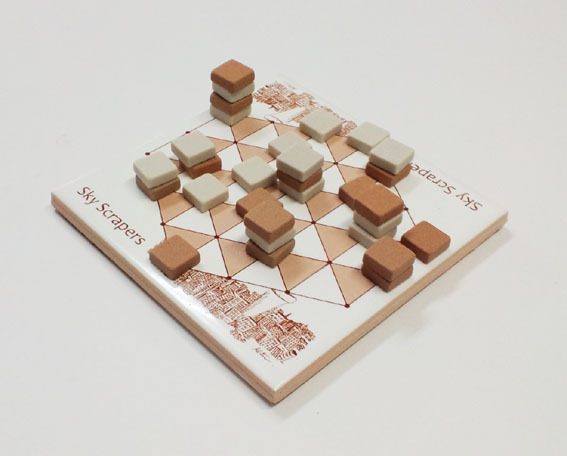 After that, decide in your usual way which player has the first move. 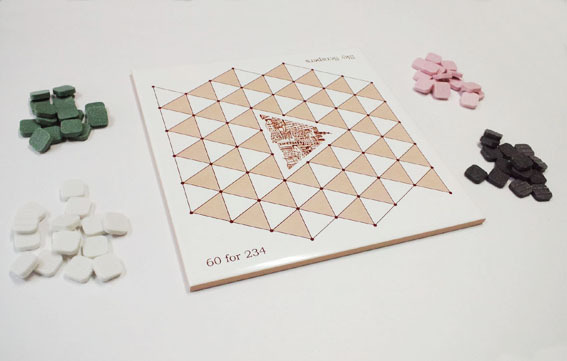 Then take turns to place your pieces on the board one by one. 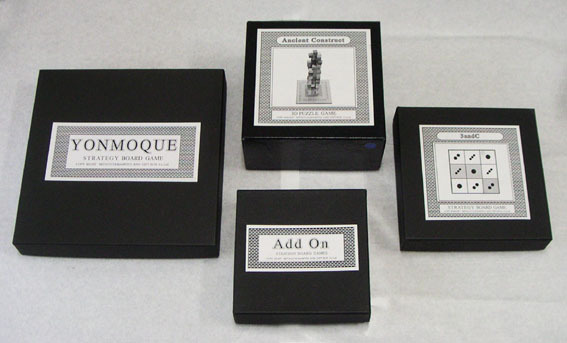 When all the pieces are in place, the player who was second to place a piece becomes the first player to make a move. 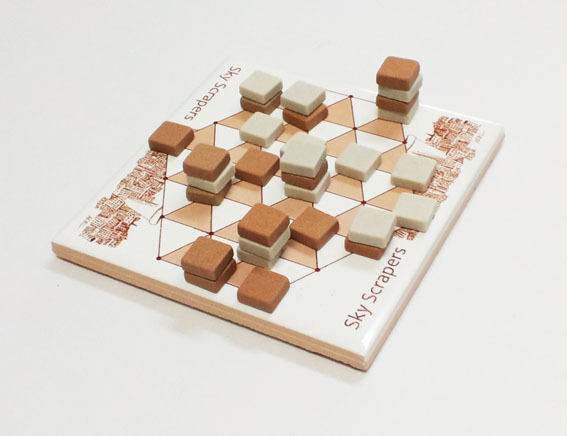 The rules of play are the same as in the standard game. Enjoy! Freedom position make us free from board size and shape at all. 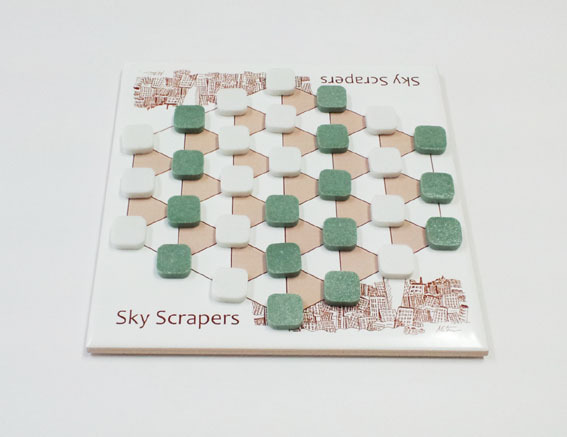 We can enjoy playing game with any kind of Sky Scrapers board. 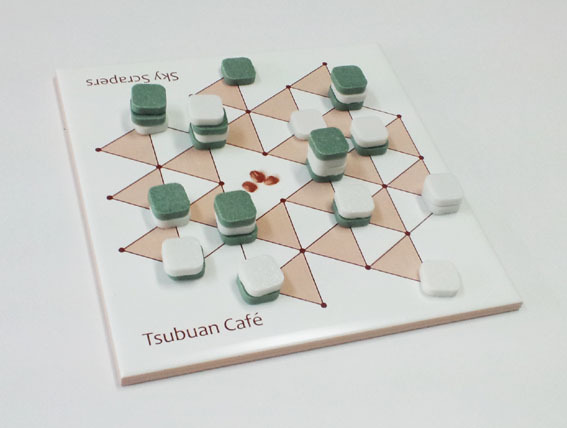 We prepare several demonstration boards for 2 players here. A4 paper is available. Please downlord and pritout them, You prepare 2 colors of flat pieces to be stacked easily. Off course you can make own original board like this. 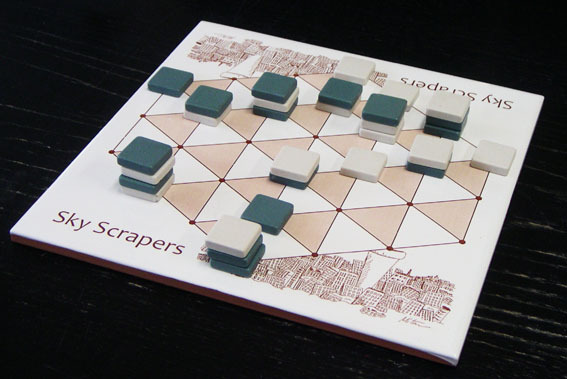 You can enjoy playing by the bigger board with 4 players.